This is the year for patent reform. Today Rep. Bob Goodlatte, chairman of the House Judiciary Committee, reintroduced the Innovation Act—the strongest bill targeting patent trolls we've seen [PDF]. The language mirrors the legislation that the House overwhelmingly passed and the White House supported in late 2013. Unfortunately, 2014 began with the Senate's failure to pass strong patent reform. Even more unfortunately, the year ended with numbers showing that patent trolling is still a rampant problem. We need to put a stop to this costly, destructive pattern of troll litigation and threats. The Innovation Act doesn't solve every patent problem—most noticeably, it doesn't tackle the fundamental issue of patent quality—but it's a strong step that would help end users and businesses, both big and small. Tell your representative to support the Innovation Act today. Heightened pleading: The bill requires patent holders to provide basic details (such as which patents and claims are at issue, as well as what products allegedly infringe and how) when they file a lawsuit. Transparency: The bill includes strong language requiring patent trolls to reveal the parties that would actually benefit from the litigation (called the "real parties in interest"). Also, if the plaintiff is a shell-company patent troll, the defendant could require the real party in interest to join the litigation, forcing them to pay up if the patent troll can’t or won't pay. The momentum for patent reform is still there, and your voice is crucial in driving this necessary change forward. 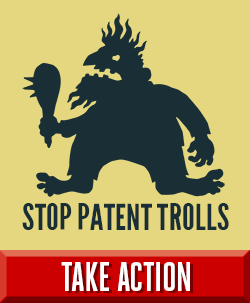 Tell your lawmaker: Let's stop patent trolls. Pass the Innovation Act!